Paul Krugman Lays Bare the Horror of This Tainted Election | "Global Possibilities"
With the new C.I.A. revelations of Russian meddling in the 2016 election, any doubt that Donald Trump’s narrow win in three swing states is severely tainted would seem to be erased. Paul Krugman begins his Monday column by pointing out that while the C.I.A. was circumspect in releasing its findings after the vote, the F.B.I. showed no such restraint when it released its damning letter about Clinton, which turned out to be nothing at all, a mere 10 days before election day. Hmmm. One could, I suppose, appeal to the president-elect to act as a healer, to conduct himself in a way that respects the majority of Americans who voted against him and the fragility of his Electoral College victory. Yeah, right. What we’re actually getting are wild claims that millions of people voted illegally, false assertions of a landslide, and denigration of the intelligence agencies. Another course of action, which you’ll see many in the news media taking, is to normalize the incoming administration, basically to pretend that everything is O.K. This might — might — be justified if there were any prospect of responsible, restrained behavior on the part of the next president. In reality, however, it’s clear that Mr. Trump — whose personal conflicts of interest are unprecedented, and quite possibly unconstitutional — intends to move U.S. policy radically away from the preferences of most Americans, including a pronounced pro-Russian shift in foreign policy. In other words, nothing that happened on Election Day or is happening now is normal. Democratic norms have been and continue to be violated, and anyone who refuses to acknowledge this reality is, in effect, complicit in the degradation of our republic. This president will have a lot of legal authority, which must be respected. But beyond that, nothing: he doesn’t deserve deference, he doesn’t deserve the benefit of the doubt. And when, as you know will happen, the administration begins treating criticism as unpatriotic, the answer should be: You have to be kidding. Mr. Trump is, by all indications, the Siberian candidate, installed with the help of and remarkably deferential to a hostile foreign power. And his critics are the people who lack patriotism? Krugman hopes, and it’s a slim hope, that perhaps the dormant consciences of a handful of Republican senators will be awakened and the sick Trump agenda can be blocked. This becomes more likely, he argues if outrage on the part of the public is sufficiently loud. That outrage should also drive people to the polls in two years, granted a long way off. Meanwhile, there are ruinous policies that must be fought. 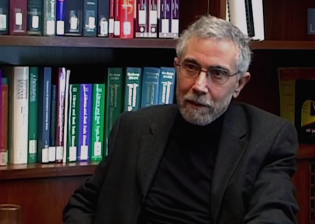 “Everything we’ve seen so far says that Mr. Trump is going to utterly betray the interests of the white working-class voters who were his most enthusiastic supporters, stripping them of health care and retirement security, and this betrayal should be highlighted,” Krugman writes. Will the Trump voters finally understand this? For the non-Trump voter, there is just anger management, increasingly difficult with every day’s fresh revelations about this disgusting election.